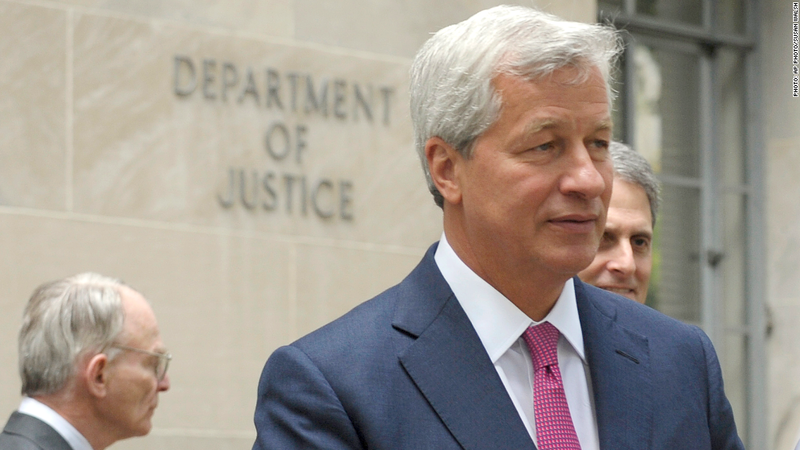 Dimon leaves the Justice Department on Thursday. JPMorgan CEO Jamie Dimon met with Attorney General Eric Holder in Washington on Thursday, continuing talks over a possible settlement of government investigations related to mortgage-backed securities. The two sides were discussing a possible settlement of at least $11 billion, according to a person familiar with the talks. That figure isn't final, however, and it's unclear if or when the two sides may come to an agreement. Also uncertain is whether JPMorgan would have to enter a guilty plea as part of the deal. Dimon was joined at the 45-minute meeting Thursday by Steve Cutler, JPMorgan's general counsel, and Rodgin Cohen, a prominent corporate lawyer and partner at Sullivan & Cromwell. Speaking at a press conference Thursday, Holder confirmed the meeting but declined to provide details on the negotiations. "This is something that is a priority for this Justice Department -- to hold accountable people who would manipulate, companies that would manipulate our financial markets for their own customers' benefit, or for the benefit of the companies," Holder said. Dimon navigated a media scrum outside the Justice Department without answering questions; a JPMorgan spokesman declined to comment. JPMorgan is one among a number of large lenders that have faced lawsuits for allegedly selling securities backed by risky, low-quality mortgages while misrepresenting them as safe investments. That list also includes Bank of America (BAC), Goldman Sachs (GS) and Citigroup (C). Mortgage-backed securities became a key cause of the financial crisis when they failed in droves as the housing market cratered. The talks center on mortgage-backed securities sold by JPMorgan, Bear Stearns and Washington Mutual in the run-up to the financial crisis, a source said. JPMorgan acquired the ailing Bear Stearns and WaMu in 2008, and is now responsible for their legal liabilities. An $11 billion settlement would be substantially larger than any law enforcement officials have secured from a single institution in connection with the financial crisis, though JPMorgan is better positioned to withstand the hit than most. The bank earned $6.5 billion in the second quarter alone. The firm -- America's largest bank by assets -- is fresh off of a settlement last week in which it agreed to pay $920 million in connection with the "London Whale" trading debacle. Also last week, regulators ordered JPMorgan to refund $309 million to customers and pay $80 million in fines over alleged unfair credit-card billing practices. -- Evan Perez reported from Washington.